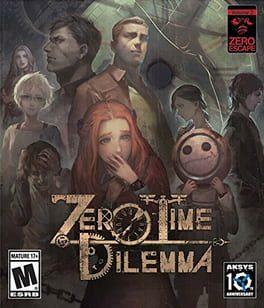 Zero Time Dilemma is the third and final entry in the acclaimed Zero Escape series. It is a story focused mystery/thriller visual novel with multiple endings that involves player choices and puzzle rooms. It is recommended that you play the games in order. The mysterious “Zero” traps 9 participants within an underground shelter, dividing them equally between 3 wards that are connected to an elevator shaft in the middle. The only way out – passing through a locked X-Door to access the elevator. Six passwords are required to unlock the door, and each password is revealed only after a participant dies. Zero’s “Decision Game” will offer teams the opportunity to kill other participants through a variety of means to obtain the necessary passwords so they may escape. Zero Escape: Zero Time Dilemma is available from 14.76 to 36.99 from 1 shops.